Book comfortable hotel accommodation at an affordable price. The rooms are equipped with everything you need - comfortable beds, working space, televisions and much more. Hostels Ekaterinburg network Arthostels - really the best, because, compared to other low-cost hotels, we have the most reasonable prices and excellent reputation . 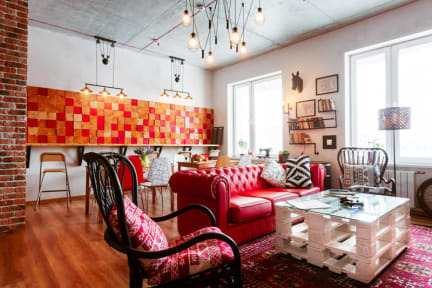 Red Hostel from Arthostels located near the train station in Yekaterinburg, a 5-minute walk from the Sport Palace, Dinamo Stadium, and Plotinka Iset river embankment. In walking distance from the hostel - Metro Dynamo. Church of All Saints is 1 km from Hostel R.E.D., and Sevastyanov's House is 1.4 km from the property. The nearest airport is Koltsovo International Airport, 17.7 km from the property. Great hostel. Staff were helpful. A few foreigners and some Russian travelers were here. Rooms and facilities were modern. The hostel is close to the trainstation and to the center. It's nicely decorated (Ikea) and clean. The staff is very friendly. Great value for money. Room spacious and great decor although bed not very comfortable. Very helpful staff. Hot showers, good wifi. A little hard to find with the directions given. We didn't know about the free breakfast, nobody told us! Overall we were very pleased with our stay! Wery clean hostel decently located between the trainstation and the city center. Staff is friendly, but not very talkative (may be different if you know Russian). Hostel itself was really nice, however it took 20 minutes for them to find us on the system for check in during which we just had to wait there. Also their clothes washer/drier doesn’t dry the clothes as advertised and when we asked if they’d put the dry cycle on again the lady said “In this country this is good” and walked off leaving us with dripping wet clothes and a train to catch the next day. It was pretty weird behaviour. Laundry service include wash and dry for 300 rubles is little expensive, and the most interesting thing is when they led me to got my clothes in wash machine, the clothes were still wet. So they ask me to hang my clothes on their clothes rack, so why I paid 150 rubles(for dry) to hang clothes myself? It's weird. This hostel has many staff(I guess they are), those staff who stand in counter are friendly, but rest of them they usually play video game in dining room, sometimes it's a bit noisy. Very terrible experience. First, when I arrived the hostel and the staff told me that they did not have my booking record and told me fortunately they had one empty room. If there was no empty room, do I need to sleep on the street? Second, most staff do not speak English. When I ask them to book a taxi for me, they told me that they don’t speak English. Third, the staff even did not know where the bus station is and simply asked me to take taxi instead. Fourth, washing machine was broken. Maybe better than a 4.0 but we wouldn't know because they double booked our room and we were moved to a different hostel in a not so nice neighbourhood some 15 min away by taxi. (We checked online, there were still several rooms available in R.E.D.) We were not asked about this change and were not offered any compensation. Not happy, not recommended. Don't book that Hostel - when we arrived they told us, that we booked the wrong hostel (which wasn't true). They took us with a taxi to another hostel on the other side of the city (we thought, that we were brought to a Hostel belonging to theirs close by). The other hostel was ok, but as said far away and lacking a nice atmosphere - it simply wasn't what we booked. Overbooking is not ok, but can happen - but the very arrogant guy from the reception didn't even apologize and treated us poorly.